My love for books has always found a place here in my baking blog. If you have been following me , you probably know that I almost always bake for my monthly book club meeting and thus the mention of the current read finds it way in my blog posts. Like always, I am looking forward to the Halloween themed cake for my next horror genre inspired book club meeting but for now , let's focus on another of my pursuits -taking part in a retro fashion show for Durga Pujo celebrations. I can't claim participating in fashion shows as a hobby pursuit or passionate inclination but after forty , one tends to be adventurous and with some real positive encouragement from friends , one tends to find oneself wearing high heels and walking down the stage . Our retro fashion show was a tribute to Bangla cinema and as such we had to focus on some dancing too . That difficult task was accomplished by taking lessons from more experienced friends in the few practice sessions we had . When it came my turn to host one of those session, I decided that we all deserved some rich pumpkin bread for all the hard work we were putting in . It's official pumpkin season , why then think of something else. 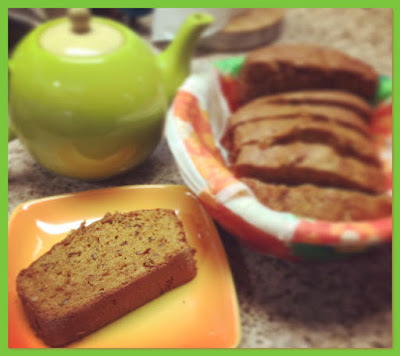 I have baked eggless healthy pumpkin bread earlier but this time , my mood was more along the lines of baking a traditional comfort food one , something to warm the soul as well as the body in this chilly October weather .It did it's job perfectly -tasting decadently rich and making us relaxed enough to chat without worrying about time on a week night . So, next time you guys have girl friends over for fashion show practice or book club meeting , do give this recipe a try . Your friends will love you after eating it . To up the "oomph" factor of this bread, you could also add 1 cup chocolate chips along with the nuts. I left that out cause I had already made some pumpkin chocolate muffins last year and as such wasn't particularly inclined to them . Another variation to the recipe which you guys can do is to add some pumpkin pie spice . Do remember to leave out the nutmeg powder then . Whether you decide to bake it exactly same or go for variation , would love to hear back from you . Enjoy the wonderful hues of the season and keep baking. Preheat the oven to 350 degrees F and grease as well as flour a loaf pan. In a large bowl , mix all the wet ingredients - eggs, oil , water, sugar , pumpkin and water. While stirring , add the dry ingredients - flour, baking soda , baking powder , salt ,nutmeg and vanilla. Now, gently mix in the walnuts with the help of a spatula. Transfer the mixture uniformly in the loaf pan with the help of a spoon. Sprinkle some coarse sugar on the top if so desired. Bake for about an hour (40-60 mins) until a tooth pick inserted in the center comes out clean . Remove from the oven , cool on a wire wire and cut into individual slices when done. Serve with a beverage of your choice and enjoy.